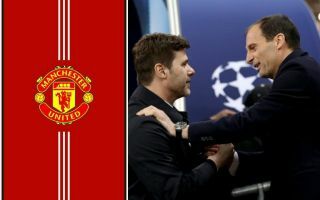 Manchester United’s search for a new permanent manager has taken a fresh turn as they step up their interest in Juventus boss Massimiliano Allegri. CaughtOffside understands United have put out feelers over finding out if the Italian tactician would be interested in the position at Old Trafford next season. The Times have previously claimed Allegri would be open to managing United after some interest from the Red Devils, and CaughtOffside understands talks now seem to be stepping up between intermediaries. This comes as a report from Don Balon yesterday puts Allegri’s Juventus future in serious doubt as they claim Zinedine Zidane is set to take over at the Turin club in the summer. This is not the first time Zidane has been linked with Juventus, and Allegri may not be too happy to see his future come into doubt given the immense success he’s enjoyed with the club. Just last night the 51-year-old added to his trophy haul with Juve as they beat his old club AC Milan in the Italian Super Cup final thanks to a goal from Cristiano Ronaldo. Despite the early success of interim manager Ole Gunnar Solskjaer, it does still look rather risky for the Red Devils to hire the relatively inexperienced Norwegian as the permanent successor to Jose Mourinho. Solskjaer has won his first six games in charge of United after replacing Mourinho last month, and the Sun have been among the sources to claim he’s now increasingly seen as a leading candidate to get the job full time. That report makes reference to Tottenham’s Mauricio Pochettino, who for various reasons also looks an unrealistic target for the club even if he seems an ideal candidate after his fine work at Spurs. CaughtOffside understands this has led United to consider Allegri, with initial moves made to sound him out, though all options seemingly remain in the air, including Solskjaer, depending on how the rest of the season goes, with key figures at the club fully aware bigger challenges lie ahead for the 45-year-old. Despite his success in Serie A, Allegri is yet to test himself abroad and would no doubt find himself with a far more challenging job at MUFC than he’s faced at Juventus. Meanwhile, Don Balon have also linked Allegri with Real Madrid as ex-Los Blancos boss Zidane could replace him at Juve, so it also seems likely he’ll have plenty of other offers if he becomes available this summer. Zinedine Zidane to replace Massimiliano Allegri at Juventus?